I didn’t learn I was actually considered a Daughter of the American Revolution until well after high school (when some of those scholarships would have come in handy). Of course, DAR has a somewhat sullied history of being racist and segregationist, which is unfortunate (though presumably remedied), but the idea of drawing a sense of pride from having a direct familial tie to the birth of your country is pretty cool. I’m also in the illustrious company of fellow DAR such as Laura Bush, Janet Reno, Bo Derek and Rory Gilmore. When I was in Virginia this past summer, Andrew (who is, of course, a son of the American Revolution) and I reconnected with the relative to whom we trace our status by driving to Rocky Mount, Virginia, to try to find the Robert Hill fort. 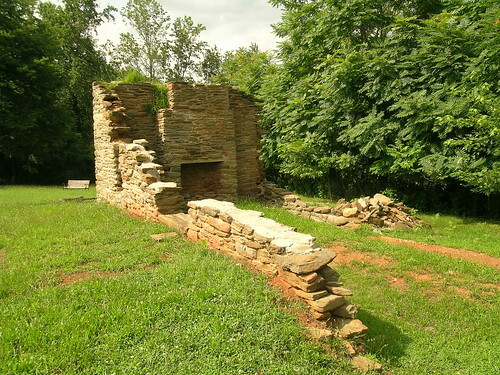 The Hill settlement was built in 1743 in what would become Rocky Mount. The stone house was designed as a fort to protect the Hill clan from Indian attacks, but to that end, it wasn’t so successful. Two of Robert Hill’s five sons were killed by Indians—one by an arrow and one by a tomahawk. A third was killed by a panther or a bucking horse. The house stayed in the family until 1917, but most of it was destroyed by a fire in 1960. The owner at the time, former Franklin County Circuit Court Judge B.A. “Monk” Davis III, allegedly stuffed four of the house’s five chimneys with dynamite and exploded them. The rest was bulldozed, save for the original chimney. Today, that is all that remains, standing just off the property of the Christian Heritage Academy. That’s where we found ourselves on a mild July Wednesday. After calling the town historical society to get some directions — one thing I learned on this trip is not to task Andrew with making calls for directions, since details like writing down said received directions tended to escape him — we eventually found the school and, off to the side, the remains of the fort. There’s not a whole lot left — a fireplace and half a wall, really — but it was a powerful experience to know that this very ground is where some of my first relatives to step foot on American soil had sat here, warmed themselves, took shelter from the wilderness around them. The site was designated a Franklin County Historic Site in 2005, and the locals had erected an information kiosk that included a brief audio overview of the history of the fort. It was weird to look at the list of donors to the Robert Hill Fort Preservation Project and, first of all, see some Hills and wonder how closely we were related and, two, not help but feel some sense of gratitude to these total strangers who had chipped in to help preserve some of my family heritage. They don’t know me, and I’ll never know them, but we’re connected in some weird way nonetheless. So, how does the Revolutionary War play into all of this? While Robert Hill died one year into the War, his family took an active role throughout. Violet helped supply food to American soldiers and their animals, and both living sons—Thomas and Swinfield—fought in the war. It is through Swinfield, who went on to become a prominent local judge, that Andrew and I receive our designation. After Andrew and I were done seeing the fort, we set out to find the Tanyard Road cemetery, where we knew at least some of the Hill clan were buried. Without real directions, our effort consisted mainly of plugging Tanyard Road into the GPS and hoping we spotted something on the side of the road. Sure enough, next to the National Guard headquarters, there was the cemetery. 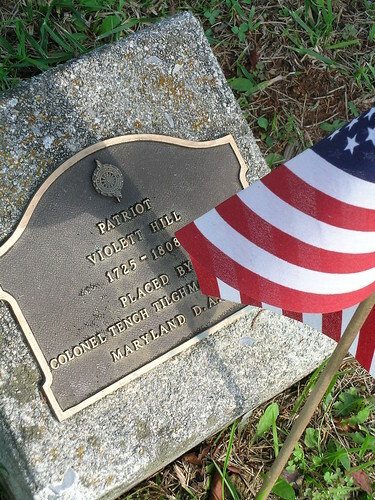 We found markers for Robert, Violet and Thomas — for Robert and Violet, their original markers were complemented by more recent ones that noted their involvement in the Revolutionary War and were accompanied by American flags; Thomas had just the newer marker and flag. It was an amazing feeling to be able to visit the gravesites of some of my earliest American ancestors and pay our respects. When I was walking to work the other morning, I was reminded of all of this when I passed a sign, painted state park brown, that read “Revere’s Ride.” I happen to retrace a fair portion of Paul Revere’s midnight ride on my normal walk to work. As you may remember, Paul’s ride went right past my neighborhood, but it continues on past the street where I work in Medford. When I walked past the sign, I thought back not only to our visit to the Robert Hill Fort, but all of my various tangential connections to the American Revolution. Living in Massachusetts, sure, you can’t help but be surrounded by them, whether it’s walking the Freedom Trail or visiting the location of the shot heard ’round the world. (In fact, I’ve seen the reenactment of Revere’s ride twice, and William Dawes’ oft-forgotten ride once — two of those three times entirely by accident.) And to be fair, being a direct descendant of someone who fought in the Revolutionary War is not a particularly rare designation. But to have visited the Virginia homestead and gravesites who helped fan the flames of revolution in their own small way, and then to come back home and realize I am — and always have been — surrounded by a story to which I have a newly realized personal connection, is pretty humbling and amazing. Sure, Violet Hill is no Paul Revere, but the overall narrative is shared. And I am a descendant and inheritor of that narrative. I touched the stone ruins of the Robert Hill Fort and walked on the Battle Green in Lexington, and in some way, those two sites are connected. If only I’d known that sitting in American History class, learning about the Stamp Act for the fifth time and wondering what was the point. What stunned me is that the book was written by a Globe metro reporter. So, this is what that tells me: the Globe, desperate for both visibility and cash during a devastating stretch for the journalism industry, decided to devote a member of its decimated metro staff to write a book — a supermarket aisle trade paperback, surely — capitalizing on the fanfare around this dopey yet homicidal med student, when there are important things happening like elections and crime and development and other urban affairs (both in Boston and its former City Weekly brethren) that require real, in-depth investigative reporting. Come on, Globe. Pretend for just one second that you are still committed to the critical mission of serving as the gatekeeper, the guardian, the conscience of this city. Really. Let me believe for just a little while that you’re not selling out your urban soul for suburban drek. Above all, please, please tell me: in what universe is a book about the Craigslist Killer worthwhile journalism? A simple question. I certainly can’t conceive of a viable answer, and I’d really like to know. EDIT: Katy in the comments makes a good point: this book isn’t published by the Globe, it’s published by CBS’ 48 Hours. So I don’t want to misrepresent the facts and imply that the Globe is publishing this book — apparently, they are not. But this does point to an important issue: reporters seeking new opportunities outside of newspaper journalism. I worry about the brain drain from where our society needs it the most. I also still believe that the Globe overall is diverting attention away from urban issues and focusing on suburban regions (with deeper pockets). Not that what happened to those attacked by Philip Markoff was not serious, but there are chronic issues of urban crime that are less flashy but that require as much if not more attention and thought. With time running out on the nice weather in these parts, I seized yesterday to accomplish something my husband and I have been wanting to do for a little while. Earlier this summer — the same day I rode my bike to Lexington, actually — Rick walked to Quincy. From Somerville. Why? We have some friends who recently moved to Quincy, and they told us about an ice cream parlor that had an eight-scoop challenge. I told Rick the only way I would let him participate would be if he walked there. 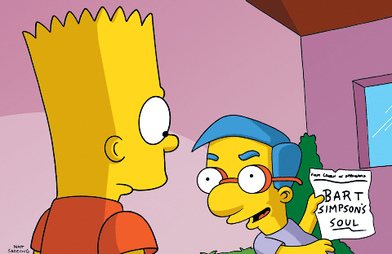 I said this somewhat facetiously — an impossible condition, I thought, that more or less amounted to a “no way” — but Rick decided to take up the challenge. And he did it — hoofing it all the way to Quincy, eating an ungodly amount of ice cream with our friend, and succeeding in not horking it up afterward. On his walk, he went through Fields Corner and noted all of the tasty looking Vietnamese restaurants there. Indeed, I had eaten at one of them when my friend Katy and I went on urban expedition through parts of Dorchester. We quickly decided that we would reprise part of the walk at a later date, with the goal of having a tasty lunch at Fields Corner. After that point, however, the weekends always found themselves filled up quickly, and here we were entering mid-September. With a sunny forecast and projected highs in the low 70s, we decided we should do the walk yesterday — after all, being New England, we could descend irretrievably into autumn by tomorrow. It turned out to be a great call. We charted the course — 7.5 miles — and set out on our way. We went through Union Square and cut through some nice looking east Cambridge neighborhoods before exiting onto Mass. Ave at MIT. We crossed the river — one of my favorite things to do in the city, it never gets old — and trundled past the commotion of Comm. Ave, Newbury and Boylston Streets. We took a brief sidetrack to view the reflecting pool at the Christian Science center — another Boston locale that never gets old to me. Once we got to the Mass. Ave T station, I was in heretofore uncharted territory (on foot, at least). I was reminded of how much I need to do a thorough wandering of the South End, not only by walking past the delightful brownstones but by rediscovering the garden area just behind the eastern entrance of the Mass. Ave. T station. I don’t even know what it’s called, but I’d been through it only once once, and by total accident at that. I hadn’t even known how to find it again, but now that I have, I must return post haste. As we continued walking down Mass. Ave, we observed the gradual transformation of the city from the hectic retail corners along Boylston and Newbury Streets to the tony South End brownstones to the less stylized areas around Boston Medical Center. Once you cross Melnea Cass Blvd., though, it’s like an entirely different city. We entered the Newmarket district and the sidewalk crumbled beneath our feet. Stores and apartment buildings were replaced with loading docks and other outlets of urban industry. In the middle of the somewhat drab landscape, however, were two intriguing eateries,Victoria’s Diner and The Hen House, that we’ll have to come back to try. We soon approached the South Bay Center, which always seems out of place to me with its big box outposts, its Applebee’s and Olive Garden. From there, Columbia Road was just up ahead, and imagine my surprise to see a giant pear right at the intersection. It turns out that the pear sculpture was erected two years earlier to mark the completion of a 12-year turnaround for Edward Everett Square. As we hooked onto East Cottage Street, we wound our way through a very charming Dorchester neighborhood — I would presume we were technically in Savin Hill? As we exited out onto Dot Ave, we took in the diversity of the stores and the people around us. By this time, hunger and the desire for a good sit were really settling in. We’d been staying hydrated with our water bottles, but we were ready for a good rest. Luckily, we soon discovered Pho So, where we had delicious fresh spring rolls, seafood pho (him), vermicelli with pasted shrimp and grilled pork (me) and the most amazing watermelon smoothies ever (they pretty much tasted like someone had thrown a watermelon in a blender — and that is in no way a complaint). As we took a load off, filled our bellies and listened to the football games on TV, we felt delightfully content. In one Sunday afternoon, we had taken a long healthy walk, seen a cross section of our amazing city and eaten a delicious meal. For one of the last nice days of the year, I can’t think of a finer way to have spent it. 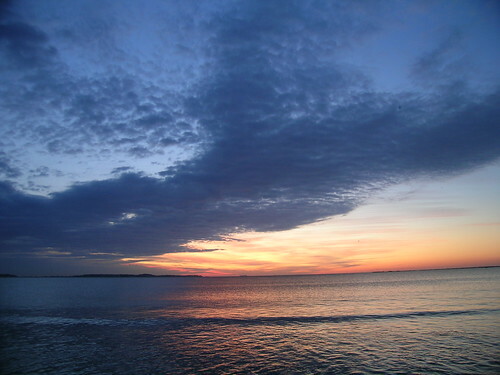 Sometime last week, I was struck by the notion of going to Revere Beach to watch the sunrise. I can’t tell you where this idea came from — I have been feeling a bit under-beached, since I didn’t make it to the Cape this summer — but it landed in my head like a ton of bricks and made itself at home. In talking with a friend on Saturday, I realized it would be quite easy: wake up a couple hours earlier than normal, take the bus and T, see the sunrise, then go to work. Not much of a production required. As I planned out my week, taking the weather into consideration, I figured today would be the best time to go. So I went to bed early last night and set my alarm clock for 4:20AM (which, really, means just before 4AM — normally I get up at 6:15AM, which is really about 10 of 6). I went into the bathroom, but then heard my husband Rick get up. When I opened the door, assuming he wanted to use the toilet, he smiled and announced he was coming with me. He thought it would be romantic to go watch the sunrise together. At first, I was a little bit annoyed, I have to admit — I had planned this great solitary expedition to the distant shore of Revere, to be humbled by the rising sun (or something like that). But as we rode the bus and hopped on the Orange and Blue lines, I became more and more glad that he was there — and impressed that he had gotten up at such a godforsaken hour to be there with me. As we exited the Revere Beach station, it was still more than 20 minutes before the actual sunrise (at 6:24AM). We stood right at the shore and watched the tide roll in, the small waves crashing and rolling and scooting us back a step here and two steps there. We studied the sky as the horizon brightened, the clouds sheared and ever so gradually a ball of light became discernible from the orange tableau. We saw the occasional jogger or dog-walker, a couple of low-flying planes, a bunch of gulls, and one person who simply took some photos and gazed out at the ocean for a while, lost in thought. We were there for a little more than a half hour before we decided to get back on the train. When we got back to Somerville, we grabbed a bite to eat and some coffee (oh, glorious coffee) at Dunkin’ Donuts before parting ways to head to work. I’m quite glad the morning worked out the way it did — for the small price of two hours’ sleep, I was able to start the day with a special experience, shared with Rick, and a bit of an adventure that transported me out of my routine. A fine way to start a Tuesday, I say. Check out my photos from the morning. Oh, the title for this entry comes from this song. It’s a good one. I was sitting on a stoop in Davis Square at 4:05PM yesterday when I realized that the weather was perfect for a run. The downpours were, I thought, behind us. It was grey, cool (but not too cool), with a slight breeze. I was transported back to San Francisco, when I went on the most perfect run one morning under similar conditions. I looked at the bus schedule and saw that there was a 4:08PM bus back home, and it would be leaving from the busway right across the street. Of course, as I walked up, there it was… pulling away, early. So I walked a bit and caught a 4:35PM bus home. Just as I got off the bus, though, the skies opened up. While I am grateful for a good drenching now and then (and indeed was this time), I was sad that the heavy rain pretty much put the kibosh on my plans to go for a run. I spent pretty much the next two and a half hours dithering about in my office, looking out the window, gauging the heaviness of the rain, occasionally stepping onto my front porch. When the sun began to set, I realized that if it was going to happen, I needed to do a run on Broadway, not along the poorly lit Mystic River. I began plotting routes on Map My Run. And at a certain point I just stood up, said “Alright,” and got dressed. I was sick of sitting around wasting time. Something had to happen, or I was going to feel lousy about it. My plans were ambitious — for me, anyway. I live at the foot of Winter Hill, which I’ve tackled by bike many a time but never while running. I plotted a route that took me over the Hill to the Powderhouse Rotary and back. If I was wiped, I could just go back home and log 3.3 miles. If not, though, I had an extra 1.2 miles in my back pocket. The hill was a lot easier than I thought it would be. Before I knew it, I was looping around (after loosening a too-tight shoelace) and heading back up the hill the other way, which was also not that bad. As I passed my 3.3 mile exit ramp, I decided to keep going. In fact, I decided to more or less forget about the length of the route I had plotted and run as long as I felt able. At this point, I wasn’t even really mindful of the fact that I was running. A lot of times, it’s a struggle — I am extra aware of each step and the labor each one requires, painfully mindful of how much distance stands between me and the next milestone, or the finish line. Sometimes, my stride is reduced to barely a trot, whether out of exhaustion, soreness, heat or some other factor. Last night, though, my pace was good. I was moving, almost mindlessly. Only my most basic brain functions registered what was going on and kept me breathing and moving, while the rest of me exulted in the sensations of exertion, of cool, damp night air rushing past me. A light mist began to fall, cooling me even more. When I stopped, at the Stop sign where I conclude all of my Mystic River runs, I felt great. I was drenched, sure, but I wasn’t winded or spent. As I walked down the remainder of the block back to my house, I felt quite alive, and grateful I stopped dithering around and made something happen. Not only did I finally tackle Winter Hill, but I logged the longest run of my short running career, in some fine running weather to boot. All it took was getting over my own inertia and getting out the door. I’m sore today, but it’s more than worth it. This morning, I’m thinking about parallel lives. In the book I just finished, toward the end, the main character is offered the opportunity to go back and relive his life from a certain point. He takes the offer, goes back to a critical moment in his life and changes the course of things, all by refraining from making a particular confession. As it is explained to him by the entity making the offer, we live in a multiverse, with parallel lives unfolding all around us. Whether or not the bee stings you in the backyard, whether or not you confess something to your girlfriend under the warmth of the covers, could have ripple effects that change lives. And in actuality, all possibilities transpire. The you that you are aware of only exists on one of those paths. As we listened to the broadcaster detailing what had just happened, we hopped on the AP wires — the greatest benefit of working at a news organization, and one I still miss, is having every wire story in the world at your fingertips — and saw the bulletins coming in. Just then, the broadcaster broke out of his measured urgency. Something else had happened, something that changed everything. Details were still sketchy when I got on the T. I got to Harvard Square, met the guys, exchanged small talk about “something happening in Manhattan,” and did the interview. I got back on the T.
When I emerged at South Station, I saw hordes of people heading toward the trains. I was baffled. “Excuse me,” I asked someone, “Are they sending everybody home?” “Yes,” someone answered. Everyone was distracted, concerned. I went back to the office and pulled up the homepage of Boston.com. It was the part of the morning after the towers fell, but when they still could not account for every plane in the sky. Soon, I was pressed into service, formatting stories, gathering information, cropping photos. About a month later, I was working on the Sunday morning when the war in Afghanistan began. Two months later, I got hired on full-time, leaving digitalMASS behind. Something missing from that timeline is the story from the interview I did that morning. It never got written. Why? Because I lost my notebook. I never lose notebooks, but this one I lost. I looked everywhere, but it never turned up. The funny thing? No one ever asked me about it — not my editor, not my interview subjects. I held my breath for a while wondering if anyone would bring it up, but they never did. Going back to the multiverse, I wonder if somewhere out there, in an untouchable dimension, my story about the guys who publish those transit schedules for mobile devices got published, another clip in my portfolio. I wonder if I snoozed through an early October Sunday morning shift, because there’s never any news on Sundays except for enterprise pieces by the AP you’ve been seeing on the wires for days but now the embargo has finally broken. I wonder if I never read any bylines from Kandahar or Kabul or Jalalabad, because those places were irrelevant and nothing the American media cared about ever happened there. I wonder if I would have had no reason to get pissed on the morning of Sept. 11, 2002, as I watched the nationally-mandated moments of silence unfold on television but saw the newsroom around me continue humming without pause. Here’s something, though: even if the aforementioned entity approached me with that tantalizing offer — hopping to another track of the multiverse to relive my life from one moment on — it is overwhelmingly likely that it would still be a life where I frantically called my friend Rob to make sure he was OK, since I didn’t know where his office was, and a life where I didn’t yet know that I should call my brother, who worked at NYU, to see if he was alright, because he was not yet a part of my life. Alas, while it is an intriguing idea, I don’t believe in the multiverse. Once an action is taken, the course is chosen. That’s just the way it is. So here we are, eight years later. And what do we have? Well, we do have one thing. We don’t have to go back in time to change the course of our lives from a single moment. This moment. Right here. We are limited by the realities that exist, but not by the array of realities we have the means to create. And no matter what happens, we always have that power. And no matter how grey the morning dawns, no matter the date on the calendar, that is always something to cherish and celebrate. I’ll Have the Usual… But Should I? I went out to dinner with a friend last night, and as we perused the menu, we joked about how we were gravitating toward our “usuals.” In this case, the cuisine was Indian, and my usual is the chicken saag. There are a couple of reasons for this. Firstly, I am a creature of habit. I enjoy comfort. Things that I know are comfortable. It is easy to stay close to the familiar. Secondly, I am all about value. If I experiment with a meal option and it backfires, I really dislike feeling like I have spent money on an unsatisfactory experience. The latter reason gets to the heart of a greater matter, my brain pieced together as I was still in the bathroom. It all ties back to being scared of failure. It’s about being terrified of making the wrong decision. It’s because, if there is a hint of uncertainty in the air, anxiety might seize me. No, I am not being this hard on myself for liking chicken saag. By this point in my thought process, I had moved far past that. Soon, though, my brain came back to The Project, which for the most part remains unstarted — not because I don’t know how to start it (well, I don’t, but that’s not the problem, I think), but because I am afraid of doing it “wrong.” It’s writing, dummy. See above. It was a very revealing trip to the bathroom, to say the least. The problem here is the notion of the status quo. Status quo, no matter the context, is always habit, comfort, familiar — all of those things. Status quo is your favorite old ratty slippers, the much-loved but much-worn, holey t-shirt. We love and crave the status quo. We have probably sculpted our status quo out of the things we know we do right, the things that are predictable and that we control. But the status quo can hold you back. By its very nature, it discourages progress. So if you want to progress, you need to shake up the status quo. And if you want to shake up the status quo, you need to break your habit, step out of your comfort zone, and do something unfamiliar. Doing those things is instant progress — perhaps unfocused and preliminary, but progress nonetheless, no matter your ultimate aim. If you set your alarm ten minutes earlier, even if you don’t know how to spend those ten minutes yet, that’s progress. But just working up the will to move those hands back that short amount of time can be a Herculean task. When I came back to the table, I ordered the usual, of course. But to tell you the truth, it was a little dull. I realized I had gained much more enjoyment from our appetizers, where my friend had recommended the paneer paratha and ordered an appetizer sampler. Here, I was happy to try new things, and was satisfied with everything I sampled. Why was this so easy? Because I didn’t initiate the situation, did not control it and therefore did not feel accountable to it. I could participate without consequence, real or perceived. It was a good reminder that sometimes, breaking out of the mold really works out. But you have to be willing to risk the chance of it not working out — of failure, so to speak — and understand that if it doesn’t work out, the world does not end. There are other meals, even other cuisines to be had. The next time I go out for Indian, I hope I branch out beyond the usual. It’s good once in a while, as the old standby. But if you lean on the usual too often, I’m learning, the law of diminishing returns begins to apply. And that probably means it’s time to see what else is on the menu. Yesterday, fortuitously, I read two items that touch more eloquently on these ideas: one was Chris Brogan’s weekly newsletter, and the other was a blog post by Amy Gahran. I highly recommend both.